In my last post I wrote about Mozilla creating more than a browser. There are many topics in that post to be explored further. I’d like to start with a discussion of the various aspects of Firefox that are important to bringing interoperability and user sovereignty to the Internet. Then we can think about how we make these various aspects effective in changing settings. provides mechanisms for people to customize the way they interact with the web and web applications. Items 1 and 2 above are generally lumped together and identified as the “platform” or “rendering engine” or “back-end” or “infrastructure” part of the browser. In the Mozilla world this part of the browser is called Gecko. The engine is incredibly important and I’ll post something on this specific topic shortly. Item 3 is generally called the “browser application layer.” If one thinks of the URL bar, back and forward buttons, the dialog boxes asking about password management, security warnings — these are all element of the “application layer” of the browser. Item 4 is generally overlooked. We don’t have an accepted industry-wide term for this part of the browser. I think of this as the “user-sovereignty core.” The browser causes things to happen on my behalf in order to tune the Internet to the experience I want. For example, in Firefox the Do Not Track feature broadcasts my preference to be left alone across all websites I visit. The Pop-Up Blocker allows me to control pop-up windows from across the Internet as well as for individual sites. The Permissions Manager (under development now) allows me to manage how web applications interact with me — location, passwords, cookies. The “Awesome Bar” makes my browsing history across multiple websites available to me, for easier navigation. (In the Mozilla case we do this without making my history available to any one else.) For those of us with poor eyesight, the browser can increase fonts sizes for all the web applications I use, even if the web application does nothing itself. The user-sovereignty core is not overlooked at Mozilla. It is a fundamental product criteria. 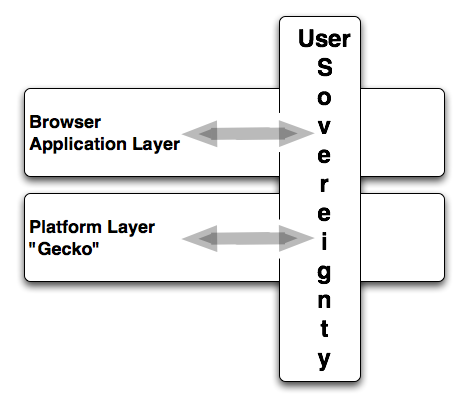 User-sovereignty spans all aspects of our offerings, from the platform layer to the browser application layer to everything else. Firefox has been the pioneer in many now common user-sovereignty features. Without the user sovereignty core the browser is a tool for websites to deliver content to people, but not a tool for individual human beings to control their overall experience. their experience in a unified fashion across all the many applications we use. This is how we create a unified experience unique to me that applies across multiple applications. Mozilla has a unique ability to put user sovereignty first. We’re organized as a non-profit precisely so that this is our key focus. Our stakeholders care about the values we build into the Internet, not the economic value we create for ourselves. We have a powerful force for user sovereignty advocacy in Firefox, and through Firefox across vast portions of the Internet. We need to continue this with Firefox. We also need to make sure this exists for other aspects of Internet life, from the mobile world to data to apps. Bringing user-sovereignty to the different ways people use the Internet is a key to fulfilling the Mozilla mission.